Why is it that an architect’s blunder is one of the most loved travel destinations in the world? 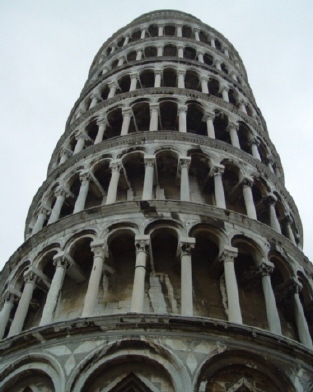 The Leaning Tower of Pisa is one of those oddities that would have probably never become famous without its tilt. Already developing during construction, the tower’s tip continues as does efforts to stop it from becoming dangerous to visitors. The tower’s fame overshadows the other residents that share the space in the same piazza: the Cathedral, the Cemetery, and the Baptistery. The Cathedral, containing the whispers of the respectful, quickly humbles the outsider with its dizzying height and dazzling artistry. The Cemetery is an anthology of arched windows, one after another consuming each hallway. Its inhabitants sleep forever underfoot as their markers adorn the walls and floors of the echoing corridors. Finally, the Baptistery silently awaits visitors leaving its slanted neighbor. Although the Leaning Tower steals away most of Pisa’s tourist attention, the Baptistery can hold its own once its talent is recognized and appreciated. The entrance worker performs a three-pitched concert. Listen to a single note sung and how long the sound takes to dissipate in the great span above. Listen again to the same single note followed by a new pitch. Close your eyes and listen to the first, second, and now a third note, sung in a chord; one voice and three echoes filling the reverberating dome with a chilling harmony. Despite the tacky row of bustling junk shacks along its outskirts the piazza is a peaceful place to explore, especially during the winter months when the tourist traffic is at its lowest. The monuments don’t take very long to visit, leaving time to peruse the neighboring museums or simply enjoy the view from a quiet bench nearby. That's it! That's all I'm holding myself to this year. So even though I'm back in the states, I'll still be working on new articles on European travel. If you don't get my weekly newsletter, send me an email at vicki(at)EuropeForTheSenses.com to be added to the distro list!